The giant leopard moth is our largest eastern tiger moth. It was formerly in the family Arctiidae which now composes the subfamily Arctiinae in the family Erebidae (Beadle & Leckie 2012). Giant leopard moths are nocturnal (Fullard & Napoleone 2001). Males are commonly attracted to lights at night. Sometimes dozens of males come to bright lights set out in good habitat (Marc Minno personal communication). Females are less common around lights. Figure 1. Giant leopard moth, Hypercompe scribonia (Stoll 1790). Photograph by Donald W. Hall, University of Florida. 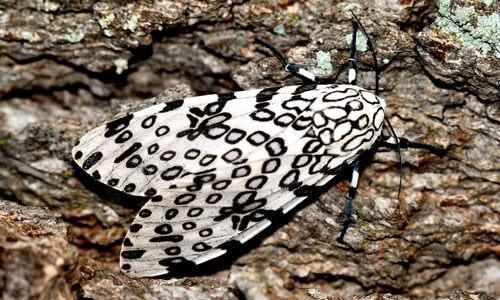 The giant leopard moth has been known by a number of synonyms. The most common synonyms in the scientific literature are Ecpantheria scribonia, Ecpantheria deflorata, and Ecpantheria denudata. For a discussion on the correct name for the giant leopard moth, see Honey and Young (1997). For a detailed taxonomic history and synonymy, see Heppner (2003). The giant leopard moth is found from southern Ontario south to Florida and west to Minnesota and Texas (Wagner 2005; North American Moth Photographers Group map). Eggs: The nearly spherical eggs are 0.8 mm in diameter and pearly gray in color (Dyar 1891). Larvae: The head, thorax, and abdominal segments 4, 5, 9, and 10 of early instars are orange. Abdominal segments 1-3 and 6-8 are dark brown, and there are orange mid-dorsal and lateral lines that run the length of the body. The spiracles are yellow. The body is covered with stiff black setae. Figure 2. Early instar giant woolly bear, Hypercompe scribonia (Stoll 1790). Photograph by Lyle Buss, University of Florida. Full-grown giant woolly bears are approximately 75 mm (about 3 inches) in length (Habeck 1987). They are black with red spiracles and inter-segmental areas and are covered with shiny black, bristly setae. For detailed descriptions of all instars see Dyar (1891). Figure 3. Full-grown giant woolly bear, Hypercompe scribonia (Stoll 1790). Photograph by Donald W. Hall, University of Florida. 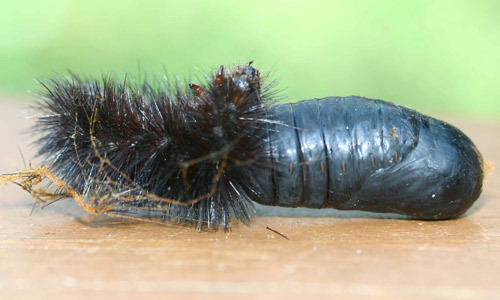 Cocoons & Pupae: Pupae are black with reddish brown spiracles (Figure 2). Pupae are enclosed in thin, yellow, net-like cocoons with small amber beads at the junctions of the threads (Dyar 1891). Figure 4. Giant leopard moth, Hypercompe scribonia (Stoll 1790), pupa with last instar larval exuviae (shed exoskeleton). Photograph by Donald W. Hall, University of Florida. Adults: The wing span is 5.7-9.1 cm (approx. 2.25-3.6 in.) (Covell 2005). 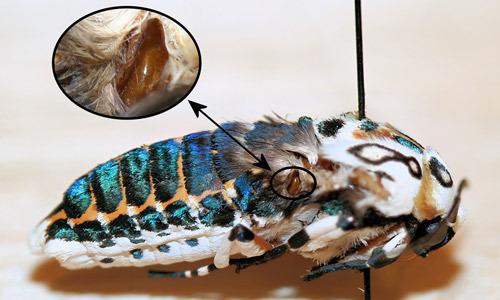 Adults are white with hollow black (or sometimes iridescent blue) spots on the thorax and black spots on the front wings that may be hollow or solid (Figure 3). Spots on the costal margin (leading edge) tend to be solid. The spots are highly variable, and in some specimens they are solid instead of hollow. Rarely, the spots are missing entirely (Minno & Minno 1991). In older specimens, the scales tend to be lost near the wing margins, rendering those areas translucent (Covell 2005). The dorsal aspect of the abdomen is iridescent, blue-black with orange lateral areas or occasionally orange with large blue-black spots. The legs also have iridescent, blue-black setae. Figure 5. Giant leopard moth, Hypercompe scribonia (Stoll 1790), adult, dorsal view. Photograph by Donald W. Hall, University of Florida. There is a single brood in the North and two or more broods in the South. Nearly full-grown larvae overwinter and complete their development in the spring (Wagner 2005). In northern latitudes, larvae accumulate glycerol to enhance their diapause freeze tolerance (Layne 2005). The giant woolly bear is polyphagous and feeds on a variety of low-growing forbs and woody plants. Table 1. is a list of recorded hosts compiled from Butterflies and Moths of North America (Undated), Concello (1970), Heppner (2005), and Robinson et al. (undated). Scientific and common names are from the Plants Database - USDA Natural Resources Conservation Service (2014). Taxonomic information and photographs of most of the plants in Table 1. are available at the Plants Database (2014). There is little doubt the giant woolly bear will feed on many other species of plants in addition to those listed in Table 1. Many tiger moth larvae feed briefly on a plant and then move to a different plant (often of a different species) before continuing their feeding. It is likely that the giant leopard moth has the same feeding behavior (Singer & Bernays 2009). This “food-mixing” results in the likelihood of eating plants that contain toxic chemicals that the caterpillars may sequester for their own defense. 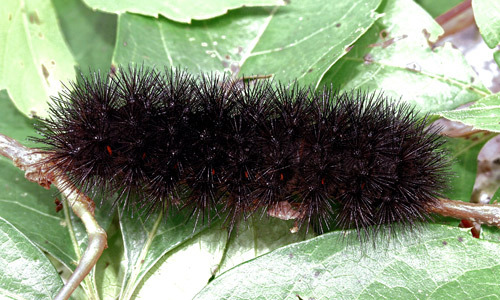 Giant leopard moth caterpillars are primarily nocturnal, but are often seen crossing roads during the fall while seeking sites to spend the winter or found under leaves or in wood piles by people doing yard work during spring and fall (Wagner 2009). They sometimes climb trees and have occasionally been found feeding at Lepidopterists’ sugar baits on tree trunks used to attract adult underwing moths (Wagner 2009). 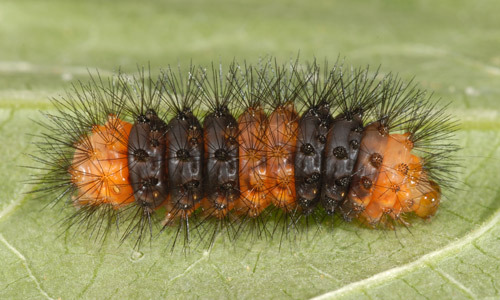 Defenses against natural enemies: Tiger moth larvae lack stinging spines and do not bite. However, the stiff setae of giant woolly bears are probably effective defenses against many invertebrate and vertebrate predators. When threatened, giant woolly bears curl up tightly to protect their vulnerable undersides. When picked up, their stiff, smooth spines are bent backward and they tend to push the caterpillars forward and out of the grip (Wagner 2009). Because of this, it is virtually impossible to forcibly uncurl them when they are in the defensive posture. Also, in this defensive posture, their bright red inter-segmental areas are highly visible (Figure 4) as an aposematic display to warn potential predators that they are unpalatable. Figure 6. Giant leopard moth, Hypercompe scribonia (Stoll 1790), caterpillar in defensive pose. Photograph by Donald W. Hall, University of Florida. It is likely that both the giant leopard moths and their caterpillars are chemically protected by chemicals sequestered from their food plants. 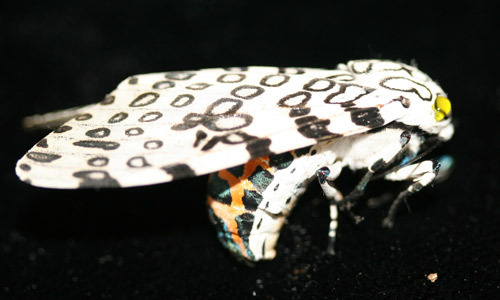 The spots on the forewings of adult giant leopard moths may serve as disruptive coloration to make them less conspicuous to predators (Simmons 2009). When threatened, adults “feign death” and curl the abdomen to display their brightly colored abdomen. They also secrete a droplet of yellow, acrid fluid from the thoracic glands (Figure 5) (Wagner 2009) that is also bitter tasting (Marc Minno personal communication). Figure 7. Giant leopard moth, Hypercompe scribonia (Stoll 1790), adult in defensive posture. Photograph by Donald W. Hall, University of Florida. Adult giant leopard moths and many other tiger moths have ears, probably to detect the echo-location sonar of hunting bats allowing them to take evasive action (Fullard & Napoleone 2001). The ears are located immediately behind the bases of the hind wings. Figure 8. Giant leopard moth, Hypercompe scribonia (Stoll 1790), with wings and some setae removed to show ears. Photograph by Donald W. Hall, University of Florida. Many tiger moths have thoracic tymbal organs with which they produce high frequency clicks in response to bat sonar (Corcoran et al. 2010). In some species, the clicks may serve as an aposematic signal (warning) of the moths’ chemical defenses (Corcoran et al. 2010), and in one species of tiger moth the clicks have been demonstrated to jam the bats’ sonar (Corcoran et al. 2011). It is not known whether adult giant leopard moths produce sounds. 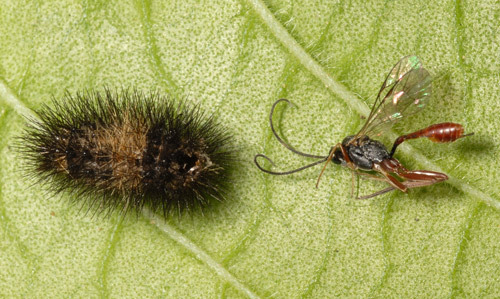 Although giant leopard moth adults and caterpillars are probably well-defended against most predators, the caterpillars are frequently parasitized, particularly by tachinid flies. Aplomya helvina (Coquillet) — updated name Phebellia helvina [Coquillet] (O’Hara 2013). Figure 9. Giant leopard moth, Hypercompe scribonia (Stoll 1790), cadaver and parasitoid wasp. Photograph by Lyle Buss, University of Florida. 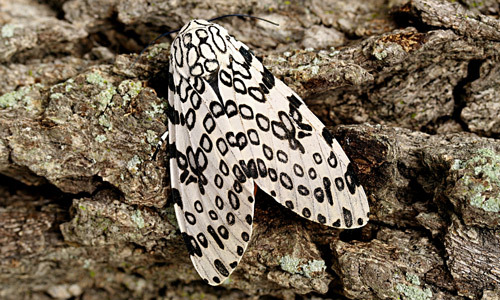 The giant leopard moth is not economically important and control measures are neither recommended nor required. Beadle D, Leckie S. 2012. Petersen Field Guide to Moths of Northeastern North America. Houghton Mifflin Publishing Company. New York, New York. 611 pp. Concello, JA, Jr. 1970. A new food plant record for Ecpantheria scribonia (Arctiidae). Journal of the Lepidopterists' Society 24: 227. Corcoran AJ, Conner WE, Barber JR. 2010. Anti-bat tiger moth sounds: form and function. Current Zoology 56(3): 358-369. Corcoran AJ, Barber FR, Hristov NI, Conner WE. 2011. How do tiger moths jam sonar? The Journal of Experimental Biology 214: 2416-2425. Covell CV. 2005. A Field Guide to the Moths of Eastern North America. Virginia Museum of Natural History. Special Publication Number 12. 496 pp. Dyar H. 1891. Notes on the life history of Ecpantheria scribonia, stoll. The Canadian Entomologist 23:106-108. Fullard JH, Napoleone N. 2001. Diel flight periodicity and the evolution of auditory defenses in the Macrolepidoptera. Animal Behaviour 62: 349-368. Habeck DH. 1987. Arctiidae (Noctuoidea). In Stehr FW. (ed.). Immature Insects. Kendall/Hunt Publishing Company. Dubuque, Iowa. pp. 538-542. Honey MR, Young M. 1997. The correct name of the North American great leopard moth. Entomologist's Record and Journal of Variation 109: 25-27. Layne JR. 2005. Freeze tolerance and cryoprotection in caterpillars of the giant leopard moth (Ecpantheria scribonia) (Lepidoptera: Arctiidae). Journal of Thermal Biology 30: 267-271. Minno, MC, Minno AK. 1991. A Florida leopard moth with missing spots (Lepidoptera: Arctiidae). Tropical Lepidoptera 2: 52. Plants Database. 2014. USDA Natural Resources Conservation Service. Robinson GS, Ackery PR, Kitching IJ, Beccaloni GW, Hernândez LM. HOSTS - a Database of the World's Lepidopteran Hostplants. Simmons R. 2009. Adaptive coloration and mimicry. In Connor, WE, (ed.). 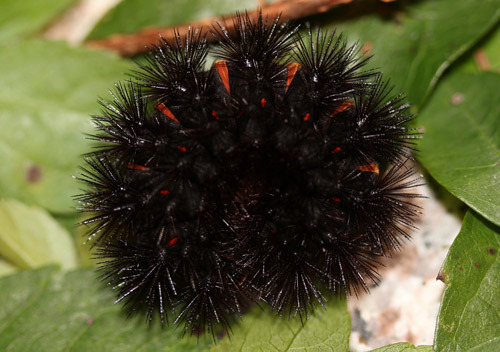 Tiger Moths and Woolly Bears: Behavior, Ecology, and Evolution of the Arctiidae. Oxford University Press. Oxford, U.K. pp. 115-126. Singer S, Bernays EA. 2009. Specialized generalists: behavioral and evolutionary ecology of polyphagous woolly bear caterpillars. In Connor, WE, (ed.) Tiger Moths and Woolly Bears: Behavior, Ecology, and Evolution of the Arctiidae. Oxford University Press. Oxford, U.K. pp. 103-114. Wagner, DL. 2009. The immature stages: structure, function, behavior, and ecology. In Connor, WE, (ed.) Tiger Moths and Woolly Bears: Behavior, Ecology, and Evolution of the Arctiidae. Oxford University Press. Oxford, U.K. pp. 31-53.